Rob Roy MacGregor (1671-1734) was a Scottish outlaw who took part in two Jacobite rebellions against the English, was in and out of trouble his entire life, and seems to have been a pretty tough customer. Romanticized accounts of his exploits began appearing in the popular press as early as 1723, in his own lifetime. He became a hero of Scottish legend, and even the title character of a novel (1817) by Sir Walter Scott. This Disney live-action film follows that tradition, presenting a lively though highly-fictionalized account of the outlaw’s career. It was mostly shot in the gloomy grandeur of the Highlands, which suits the tone of the picture, darker than that of most Disney adventure films. 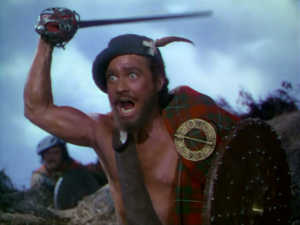 It fact, it was a disappointment at the box office, due I think to this somber tone, and to the portrayal of the hero by star Richard Todd, whose hard-bitten Rob Roy is a bit too grim and vengeful to be truly sympathetic. The story is the time-honored tale of the doughty but disorganized Scots, brave with their swords and shields, beaten again and again by the perfidious English with their serried ranks of muskets and bayonets, not to mention their horse dragoons and artillery, the big cheaters. The victorious English oppress the Scots, the clansmen exact reprisals, and the cycle continues. The Scots here are mostly broad caricatures, hard-fighting and hard-drinking, the camera dwelling on their colorful celebrations of marrying and burying, the pipes skirling at every opportunity. To be fair, the wicked English are cartoon parodies as well, their bewigged officers taking snuff and curling their lips, sneering in contempt at the barbaric Scots. The halting English of their imported German king, George I, also comes in for its share of mockery, so no nationality goes unscathed. In truth, the only sympathetic and three-dimensional people in this thing are Glynis Johns, lovely and heart-breakingly earnest as Rob Roy’s lady-love Helen MacPherson, and the massive James Robertson Justice as the Duke of Argyll, a Scottish noble seeking to find an honorable way to end the ongoing bloodshed. Whenever he shows up, his commanding presence dominates the screen, and we know he’s going to win in the end by dint of sheer moral authority. But not before we’ve had the requisite number of ambushes and escalades, pursuits and escapes, and pitched battles with howling swordsmen and roaring cannon. Scotland Forever, I guess.